A collaboration between nano- and neuroscientists has resulted in a system that kills the most aggressive, and most common, form of adult brain cancer. 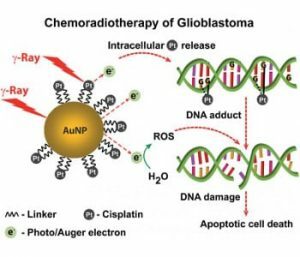 A collaboration between nano- and neuroscientists has resulted in a nanoparticle-based system that kills the most aggressive, and most common, form of adult brain cancer, glioblastoma multiforme. The treatment, which uses gold nanoparticles tethered with the chemotherapy drug cisplatin, completely ablated in vitro model tumour systems when combined with radiotherapy, in a process so effective that no evidence was found of cell revival 20 days after the initial exposure. In the first stage of experimentation, the group simply used gold nanoparticles coated with polyethylenimine, a polymer which interacts with proteins on the cellular surface in such a way as to ensure uptake. Once the particles are inside, exposure to radiation at standard radiotherapy frequencies causes the emission of ionising photoelectrons and Auger electrons. The damage caused by this initial system was substantial, but certain treatment-resistant cell populations were found to recover after a few days. Better results were found once cisplatin was added. Its chemotherapeutic properties act synergistically with the radiosensitizing gold effect, and together they were found to reduce visible cell population by a factor of a hundred thousand within 20 days, with no population renewal detected. The group intend to work towards human trials of their treatment – in particular, more work is required to optimise the size and surface chemistry of the nanoparticles so that they can be safely used in vivo, and to develop an effective way to deliver them into the body. Ultimately, the researchers believe that their system may well work beyond glioblastoma, and could be used for other aggressive or challenging cancers.